As promised, Apple has set OS X Mountain Lion loose on the world — and it’s now emphatically “OS X,” no “Mac” in the name. Mountain Lion represents Apple’s latest attempt to innovate its desktop platform while bringing features it pioneered in its iOS mobile operating system “back to the Mac” — and this time, OS X is actually a little ahead of the curve, premiering some things that won’t make it to Apple’s portable devices until iOS 6. With Mac OS X 10.7 Lion, Apple’s desktop and mobile worlds were an uneasy blend. Does Mountain Lion successfully bridge the two worlds? And what else does Apple’s latest “big cat” bring to the table? Find out in our in-depth first impressions. Right now, OS X Mountain Lion is only available through Apple’s Mac App Store for $20. Customers have to have an Apple ID and either credit (such as iTunes gift cards) or payment information on file with Apple to purchase a license to the new operating system. There’s no walking into an Apple Store to pick up a copy, and you can’t have a handsome delivery guy turn up with one overnight. With Lion, Apple offered a version on a USB stick for recovering machines that had crashed or suffered drive failure — presumably they’ll do the same with Mountain Lion, but for now, it’s download-only. Before buying, make sure your Mac is eligible: that generally means any Mac with an Intel Core 2 Duo processor or newer — but not all machines qualify. 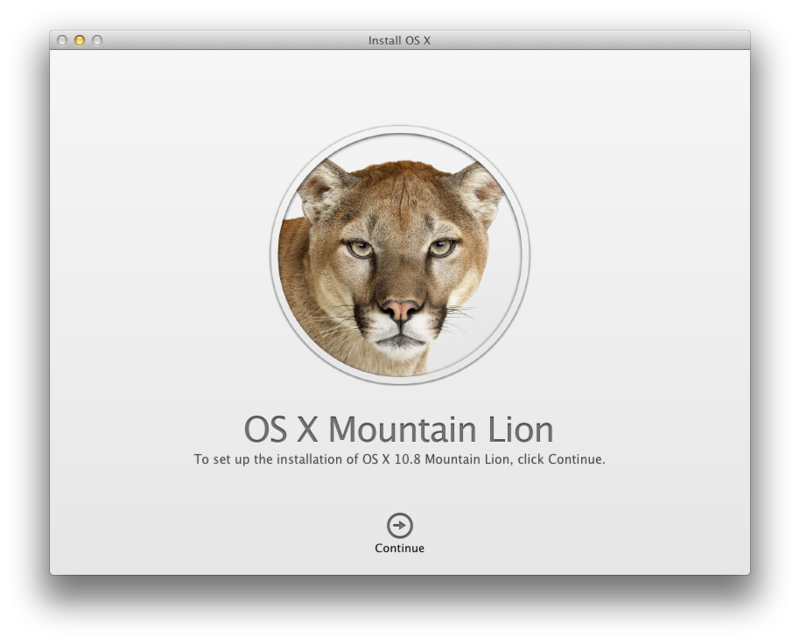 Check our OS X Mountain Lion installation guide for full details, as well as other things folks should consider (like making a bootable backup!) before jumping on Mountain Lion. 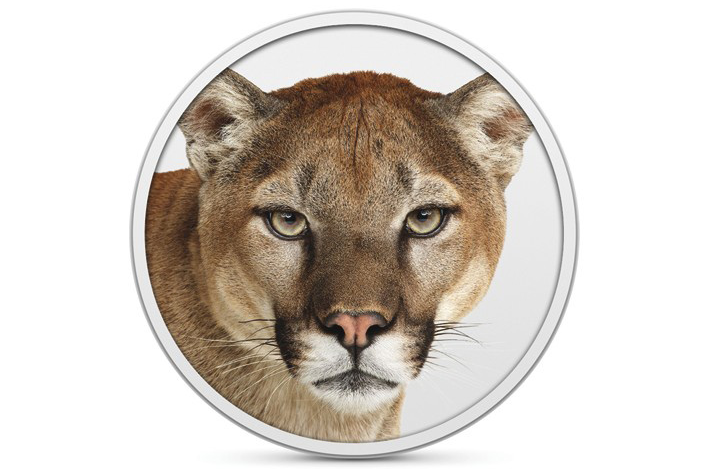 Mountain Lion weighs in at 4.3GB. Even if you have a high-bandwidth Internet connection, simply downloading Mountain Lion from the App Store is going to take a while. And that’s just the beginning of the process. Once the download is complete a Mac will zip through some reassuringly fast tasks, report the installation is complete and that the Mac needs to be restarted. Anyone familiar with Apple’s update-in-place process for system updates knows that’s just the beginning. The Mountain Lion installer truly kicks in after the restart. In our experience, the installer typically reports it needs anywhere from 25 to 60 minutes to complete the installation. We’ve never found it to take less than double the amount of time the installer estimates, and that usually includes some stalls midway through that can look suspiciously like a crash or hung machine. However, we’ve also never seen the Mountain Lion installer fail. There are bound to be exceptions, but our experience is to give it plenty of time and have faith. There are no custom installation options with the Mountain Lion: users must accept the license agreement (or not). You’d think with 4.3GB, Apple could pack pretty much everything into the Mountain Lion installer, but that’s not really true: users may still find they’ll be selectively connecting to the Internet to download components, including things like third-party printer drivers and online help guides. Be ready for occasional delays as you get started with Mountain Lion if the default components don’t include everything your particular Mac needs. Mac OS X 10.7 Lion was mostly complete when Apple introduced iCloud, so integration was limited. 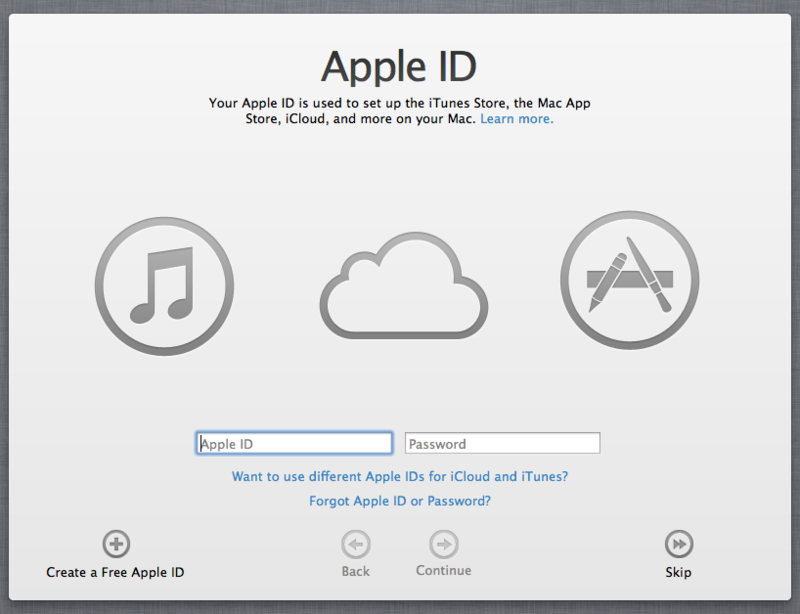 Mountain Lion, however, is truly the first version of OS X designed with iCloud in mind, and nothing makes this clearer than when Mountain Lion (finally) starts up: it immediately requires users to sign in to iCloud. If folks don’t already have an AppleID, they can create one on the spot. No pressure, right? Users can choose to synchronize contacts, calendars, notes, reminders, and email via iCloud, as well as bookmarks and (with Safari 6) even Web browser tabs. This has obvious advantages for folks juggling multiple Macs, or a Mac and one (or more!) of Apple’s portable iDevices: change or add a calendar item in once place, it’s immediately synchronized to all a users’ devices. Email, messages, photos, and documents can be immediately synchronized: no more sending multiple versions of things to yourself via email, futzing with USB drives, or trying to find your phone because the message you want to reply to isn’t on your Mac. iCloud doesn’t put an end to services like DropBox, nor third-party email services like Gmail, but iCloud’s transparency and near zero-configuration makes it tremendously easy to use for folks willing to embrace the Apple ecosystem — and there are millions upon millions of those every week. With Mountain Lion, Apple is exposing more of iCloud’s “Documents in the Cloud” feature, which enables users to store documents on Apple’s servers and access them from any iOS device or Mac. Built-in apps like Preview and TextEdit now support Documents in the Cloud, and Apple has also released new versions of its iWork apps (Pages, Numbers, and Keynote) to support Documents in the Cloud. Unlike the Internet-based storage Apple used to offer with iDisk (part of the now-defunct .Mac and MobileMe services) or similar offerings like DropBox, Mountain Lion users can’t just pop open a Finder window and peruse the contents of Documents in the Cloud. Instead, Documents in the Cloud manifests as a feature of Save dialog boxes and a new modeless Open window for opening documents — and users’ iCloud documents are managed on an app-by-app basis. For instance: say you use Apple’s Pages word processor on the iPad, and save documents to iCloud. If you use Pages for the Mac, all those documents will be immediately available in the Open dialog box using iCloud, with the most recently-used documents shown first. (There’s also a sortable list view.) However, the only way to see those iCloud documents will be through Pages’ Open dialog box. If you try to find those documents with another iCloud-savvy app — like, say, TextEdit — they won’t be listed because those documents weren’t created by TextEdit. In some ways, this approach makes sense. Many folks think of documents as belonging to a particular app, and (perhaps more importantly) most everyday computer users — Mac, Windows, or otherwise — want nothing to do with the file system. That’s a mentality that’s been emphasized in recent years by mobile devices (like the iPhone and iPad) that totally divorce users from the file system, and it’s hard to argue that it’s a good idea when you see even seasoned computer users struggle to navigate and find things in a directory hierarchy. For everyday folks, simply showing a searchable list of documents created by a particular application is enough to meet most needs. However, the Documents in the Cloud approach rapidly falls down with power users or savvier folks who routinely pass files between a variety of applications. Maybe you take screenshots, crop and and save them in Preview, but later want to open them in an iCloud-savvy image editor? That won’t work. Maybe you create a quick text document in TextEdit and later want to spruce it up in Pages? Pages will open text documents just fine — but it won’t be able to see anything you’ve stored in iCloud using TextEdit. So that’s off the table. The old school isn’t dead yet, and Apple does know many folks will want to move documents stored in iCloud to different apps. The official method is moving (or copying) the documents from iCloud to your local Mac: documents stored in iCloud can be dragged (and option-dragged to copy) in and out of the new Open window to and from the Finder. Making that TextEdit document accessible to Pages via Documents in the Cloud means dragging or copying it out of the Open window to your Mac, then dragging (or copying) it into the Open window for Pages. Managing documents via iCloud is certainly awkward…but it’s probably a glimpse into the future. The only way iCloud makes sense going forward is if users are eventually able to keep most of their information — contacts, mail, calendars, photos, media, and personal documents, and everything else — in iCloud, and simply access them from whatever device — a computer, a phone, a tablet, a television — that they happen to be using at the time. Apple is serious about putting iCloud at the center of its entire technology ecosystem — and Mountain Lion is the first time OS X makes it difficult to avoid. Everything comes full circle: this is kind of how mainframes and dumb terminals used to work, albeit on a much smaller scale. So: is Documents in the Cloud workable? Right now, the answer will vary from person to person, but my sense is that it’s straightforward enough for folks with a relatively small number of items to manage — I can’t see the interface or current capabilities scaling well to dozens (let alone hundreds) of items per application or truly sizable items. Apple gives each iCloud user 5GB of storage for free; folks who need more need to pay $20 to $100 per year for 10 to 50GB additional storage. Apple says 5GB is plenty for most people — and for documents and app data (since purchased apps, books, music, and media — as well as Photo Stream — don’t count against the total) that’s probably true. But as the universe of iCloud-savvy applications expands, more users will find it tougher to squeeze into 5GB. Third-party applications can also integrate direct support for Documents in the Cloud, but to do so they have to comply Apple’s new sandboxing and be sold through the Mac App store. (More on that below.) 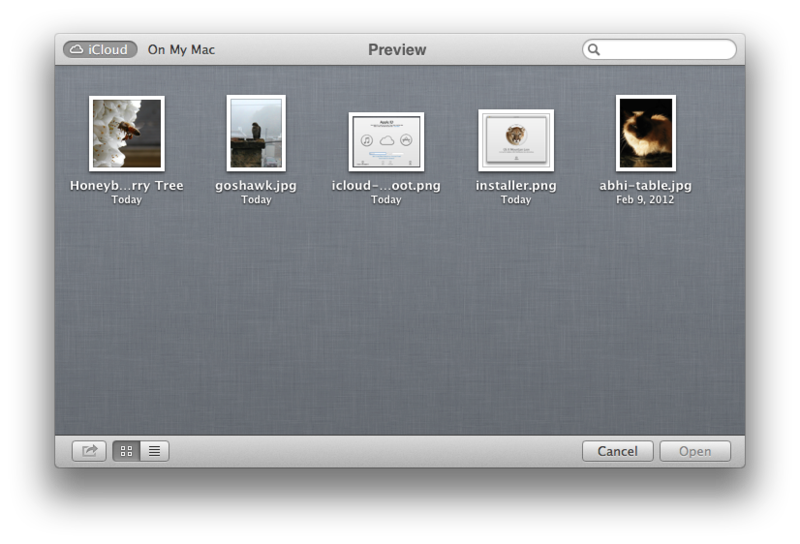 Other new Mountain Lion features are also limited to apps approved by (and sold through) the Mac App Store. Getting Mountain Lion	Back to the Mac	Sharing and social integration	What’s not fixed?